Take an Oahu Scenic Drive and Discover the Windward Side. 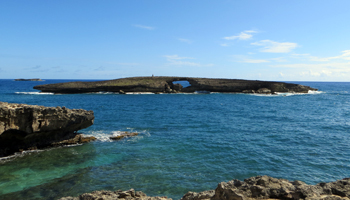 Take an Oahu Scenic Drive. Discover the Windward Side! Few things let you appreciate Hawaii’s natural beauty of better than an Oahu scenic drive along the island’s northeast (Windward) coastline. I guarantee that I’m biased, because this is the area where I grew up… but for majestic mountains, lush vegetation, and beautiful coastal scenery, there are few scenic places anywhere in the world that I’d rather drive. And it just happens that there are several points of interest along this route as well – to make your experience all the more enjoyable. I’ve identified each scenic Hawaii sightseeing point of interest as an individual sight/stop below. You can stop at all of them, or none, depending on what interests you. You can hop out of the car for a few quick pictures, or you can stay and play – again, depending on your desires. 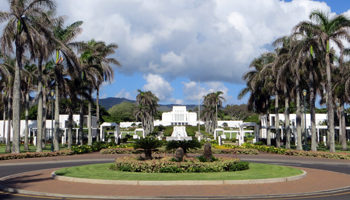 So pile the family into your rental car and let’s hit the road for an Oahu scenic drive past several of my favorite Hawaii things to do and see on the Windward side. The whole experience could take two hours without stops or all day with lots of time for play. I’d plan for at least three or four hours on the road, since you’re making an activity of it. 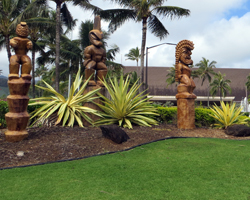 Your Windward Oahu scenic drive will probably start at your hotel in Waikiki, Honolulu, or Ko Olina. 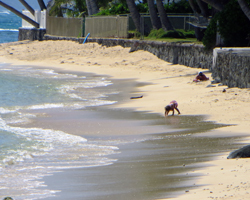 From any of these locations, get on the H1 Freeway in the direction of downtown Honolulu. Although you could take the H3 Freeway, Likelike Highway, or Pali Hwy to get through the mountains to the Windward side, I’m going to recommend that you take the Pali Highway. That way, you can stop at the Pali Lookout right before you go through the tunnel and get a preview of what you’ll be seeing. The weather can be very different from one side of the mountains to the other. So if the weather looks objectionable, you can turn around and go back with no time wasted. But if the weather is pleasant, you’ll get a glimpse of the glorious Hawaii sights you’re about to see. The first stop on your Windward Oahu scenic drive can be Heeia State Park. 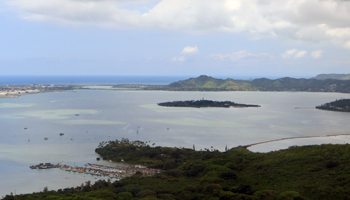 This is a beautiful park for picnicking; and it’s where you can get some great views of Kaneohe Bay – from the Heeia Fishpond (pictured at top) to Coconut Island (Gilligan’s Island) on your right, around to the Heeia Kea Pier on your left. This pier was one of my favorite fishing spots when I was a kid. It was also one of the major locations used in the film “50 First Dates”; and just out from the pier is where the open ocean scenes of the last "Pirates of the Caribbean" movie were filmed. Then directly across the street from the pier, in the jungle area, was where parts of the television series “Lost” were filmed (scenes involving the cockpit of the airliner). Unfortunately, there’s nothing to see there but jungle. To get the view shown in this photo, you have to hike Puu Maelieli, which is part of Heeia State Park. 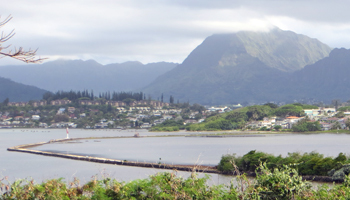 Having just seen the Heeia Fishpond, your Windward Oahu scenic drive continues to the northwest, where your next stop can be the Kahaluu fish pond. Unfortunately, they usually keep this place locked-up tight, so the only really good view is from the Puu Maelieli trail (see photo at right). But since you’re driving and not hiking, you can also get a view of this Hawaiian fishpond if you continue driving along Kamehameha Highway past the gas station at the intersection of Kahekili Highway and across the bridge. Then immediately turn into the gravel parking lot on the right, next to the mouth of the stream. From that vantage, you can see a portion of the Kahaluu fish pond, which was once the location of the Okinawan village that was the primary set of the film “Karate Kid 2”. Now it’s used primarily for weddings. 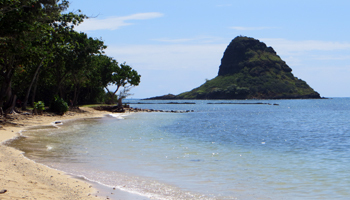 The next stop on your Windward Oahu scenic drive can be Kualoa Regional Park, where you’ll get the closest possible view of Mokolii Island (mo-ko-lee-ee), which is better known as Chinaman’s Hat (due to its distinctive shape, which is reminiscent of the conical “coolie hats” commonly worn in days of old by immigrant plantation workers). 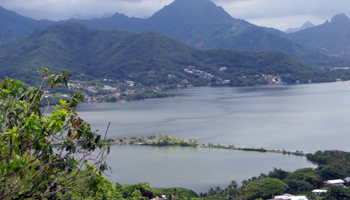 Though you can see this little islet from every part of Kaneohe Bay – and even as far away as the Pali Lookout, you can’t beat the view from Kualoa. And if you follow Kualoa Beach around to the right (the direction from which you have come), you might be able to catch a glimpse of the Molii fish pond hidden among the trees. If you want a really clear view of this pond, you’ll probably have to do some wading or pay for the Secret Island tour. Kualoa Regional Park is an excellent place for picnicking, and not a half-bad place to go for a swim. So if you’re ready to stretch your legs for a while, this might be the place to do it. Continuing along the coast to the northwest, the next stop on your Windward Oahu scenic drive can be the Crouching Lion rock formation. Unfortunately, natural weathering seems to have made the distinctive outline a bit worse for wear in the last 30+ years; but this rock outcrop still appears to have the shape of a male lion at rest – at least in the abstract. There has never been a designated viewing area, and many people have no idea where to look for this unique Hawaii sight. So do this… stop at the intersection of Kamehameha Highway and Lau Place. Then align the street sign with the lamp post behind it (as seen in the photo at right). The imaginary line between these two posts should point almost directly to the shape of a crouching lion on top of a rock. 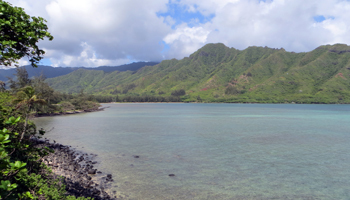 Immediately around a bend in the road from the Crouching Lion Inn is Kahana Bay. Though not an ideal beach for swimming due to the rocky near-shore sea bottom and murky water from stream runoff, this is nevertheless a beautiful bay simply due to the way it’s framed by the mountains. Furthermore, it’s just about as isolated as any Oahu beach can get; so many people like it just for the absence of crowds. It’s a somewhat popular (though not crowded) place for local residents to go camping, fishing, and sometimes even snorkeling and kite surfing. The last stop on your Windward Oahu scenic drive can be approximately 1 km (1/2 mile) farther up the road inside the Malaekahana State Park. The park itself is another great place for picknicking and playing at the beach. I’ve been camping there dozens of times. But in case the beautiful Malaekahana Beach isn’t adventurous enough for you, this is also your opportunity to do a neighbor island excursion. You won’t be flying out to Maui or Kauai, but you can wade, float, or swim out to Mokuauia Island, which is more commonly called Goat Island. 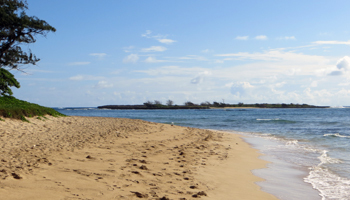 This little off-shore islet has its own sandy beaches and sheltered coves where you can play. Note: the island is also a seabird sanctuary, so you’ll have to watch out for nests (holes in the ground everywhere). Furthermore, the crossing can be a little tricky because the water depth varies from shin-deep to neck-deep; and there are cross-currents with waves. Plus, it’s all reef and rocks, so you won’t want to be barefoot. Shortly past Malaekahana, your Windward Oahu scenic drive will round the northern tip of the island and then you’ll be on the Oahu North Shore. You can stop at one of the shrimp shacks or trucks for some fresh-caught shrimp. You can stop at any of the famous north shore beaches for more Hawaii fun activities; or you can continue without stopping into Haleiwa (Hah-lay-ee-vah) town for a shave ice and shopping. Maybe you’d prefer a Dole Whip… Just keep on driving right up to the Dole Pineapple Plantation in Wahiawa. 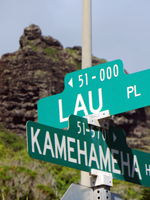 As long as you stay on Kamehameha Highway, you can follow the signs back to the H2 Freeway, which will then connect you to the H1 Freeway, which will get you back to your hotel. Wish someone would do the driving for you? 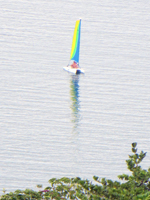 Consider booking a tour: Circle Island Sightseeing - CLICK HERE! (Link opens a new window/tab).